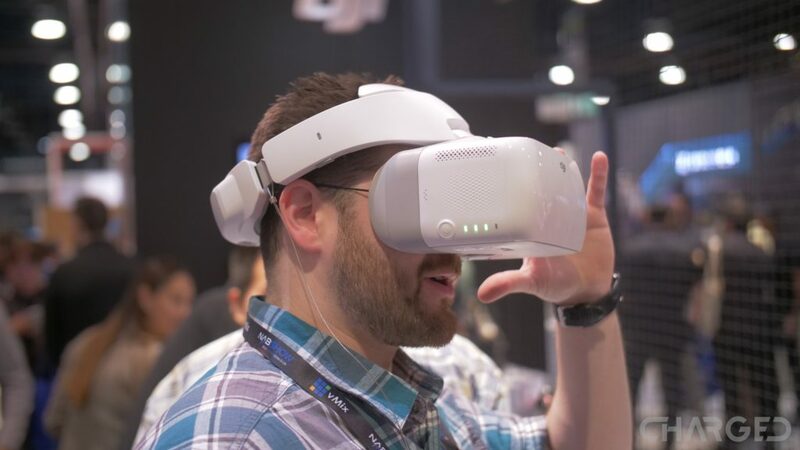 After surprising us with the new DJI Goggles and more this week, DJI had a set of the new VR headgear on hand at the NAB Show in Las Vegas. We were at the show and got the chance to meet up with DJI to test the goggles for ourselves. In a growing market of exceptional VR gear, DJI took to drone usage first, but ended up with a powerful alternative to the other headsets out there. We’ll be exploring the DJI Goggles on our VR website vrsource.com as well, stay tuned. If you have not yet run down the spec sheet, hit our announcement post for the DJI Goggles here. 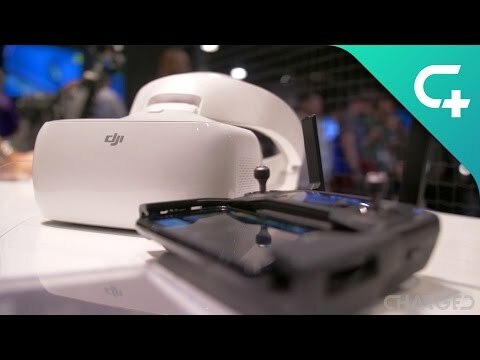 Packing dual 5-inch monitors, six hours of battery life and versatile connectivity, DJI may have created a device that goes well beyond providing an immersive FPV experience for drones. Picking up the Goggles, they feel about as heavy as they look, and I dare say that is moderately heavy. Engineering overcomes this obstacle, these are some of the lightest feeling VR goggles I’ve ever attached to my head. Well placed padding, and a different approach to weight-baring make the DJI Goggles a balanced and easy to use experience. 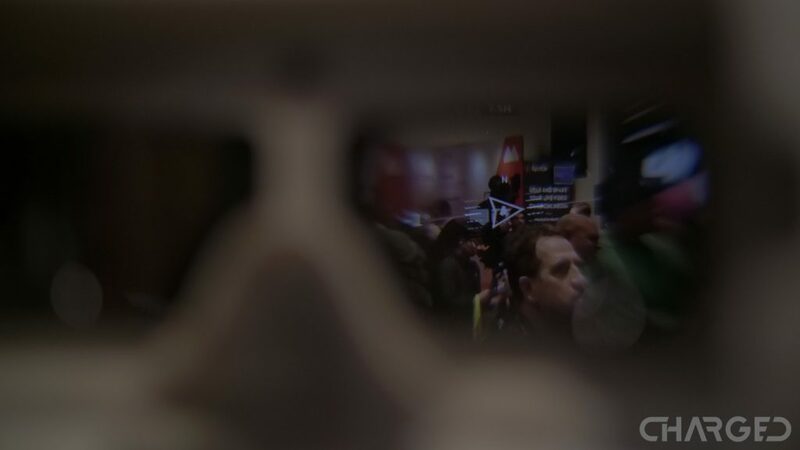 Best of all, as you probably know by now, I wear glasses – the DJI Goggles are the first VR gear that I simply put on and enjoyed without having to fuss with set up. My high nose bridge also means that many screens-for-the-face are either painful or just impossible to get aligned. If nothing else, this tends to leave a large gap at the bottom with enough light bleed to ruin the experience. Joshua Vergara tells me that the DJI Goggles are very similar to the Sony goggles, but I have not had the opportunity to play with those and have found nothing as comfortable as DJI’s take. Now that you know that I rank the DJI Goggles extremely high simply because I can actually use them, forgive my bias moving forward. Many headsets on the market today have a caveat that is often a major barrier to entry. Not everyone owns the brand of phone that is in question, or most people can’t afford a full VR rig and high-end PC. I feel like the DJI Goggles have hit a sweet spot. Sure they are drone FPV goggles, but they’re a display for near anything else as well, if you want. HDMI is a fairly powerful display connection port, even though it’s not the full size port, the Goggles have an input port in the family. 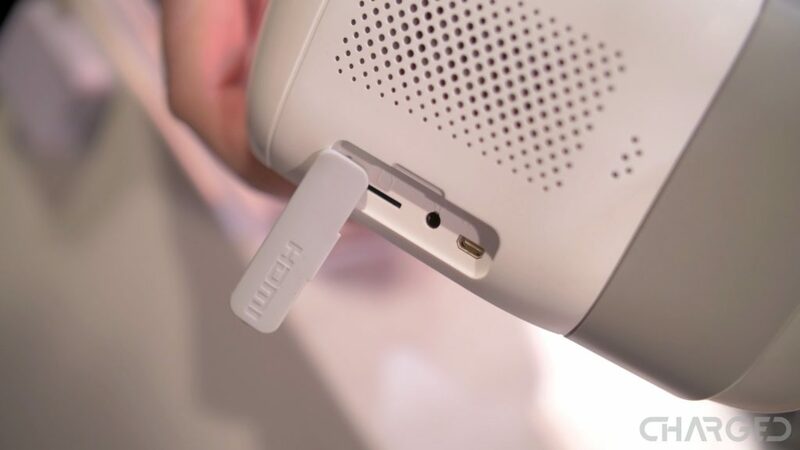 If you do not know what this means, it’s simple, your DJI Goggles can be a TV screen, a video game monitor, a personal theater, or you could even use them to fly drones. Myself, I want to try using the goggles as a monitor attached to my DSLR and as a screen attached to my phone. I’ll have to find the right Android phone that supports video output, but I’m guessing there’s a site that can help with that… That’s the one, Android Authority! What measures up to feel like a 216-inch screen fairly close to you is a pair of HD panels with more than adequate brightness. In addition, there is little more fun to be had with a drone than the ability to connect up to two people into the flight. I face this frequently, when showing off footage, I am asked why I didn’t point the camera in a certain direction – Slapping a VR headset on my audience allows them to see what they want all without compromising my flight path or safety. You can keep the DJI Goggles as a display only for your drone flight, or you can give the head-tracking tools a try. This is the mode you see in the video above, as the Goggles wearer twists and tilts their head, the camera gimbal follows. Not shown off is that the wearer can even manipulate the yaw of the craft – as the headset spins in a circle, so shall the Mavic Pro. I have as many pros as cons for this functionality, I guess we’ll have to test with an actual flight when the time comes. We are very excited to get our hands on a retail set of DJI Goggles, to put them through their paces. For now, we were happy to test the headset at the NAB Show 2017, and we hope we’ve given you enough info to decide on placing your own order.